El Nido is probably the most popular place for tourists in the whole province of Palawan. Aside from the stunning natural beauty of the place, it also is one of the most historical places in the Philippines. It is said that El Nido has been inhabited by humans as early as 2680 BC, or even as much as 22,000 years ago. With over fifty white sand beaches, extensive marine life, lagoons, and a number of endangered animal species, this is a true paradise. There are several set island hopping tours you can do in El Nido catering to all tastes. Some tours are scuba diving tours, seafaris, party boats – you name it. When you have the beauty of El Nido within your grasp, it’s pretty hard not to have a good time. 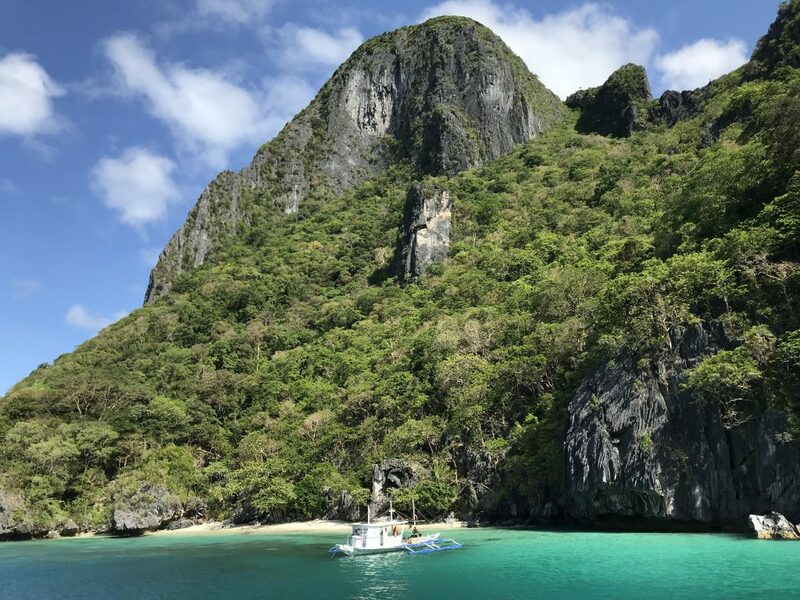 Some people aren’t comfortable with scuba diving, so exploring El Nido by boat is just as good, if not a better way to absorb the beauty of the place. When you are in El Nido, or anywhere in Palawan for that matter, you simply must try scuba diving. There is no better way to discover El Nido or the rest of Palawan for that matter than underwater. If you have never been scuba diving before don’t worry, I had not been scuba diving either until going to Palawan. If you use a reputable and PADI accredited dive resort like Submariner Diving Centre, this takes away any apprehensions you may have about scuba diving. Even the main beach in El Nido town proper is awesome. 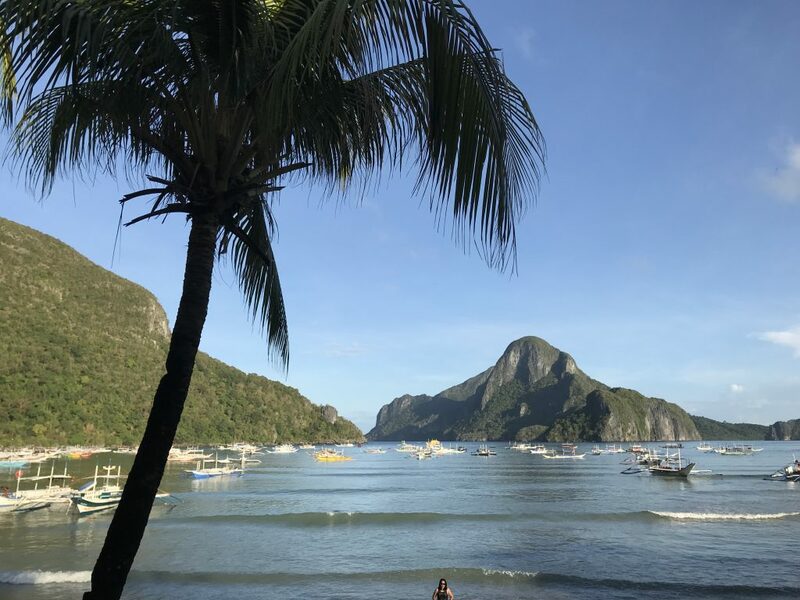 When you are on the main beach of El Nido town proper you look straight out across Bacuit Bay towards Cadlao Island, this sets the scene for what to expect from the rest of El Nido. Then turning inland, less than one km from El Nido town center, is the Canopy Walk. This offers breathtaking views of Bacuit Bay from Taraw Cliff. The jagged limestone cliffs are a feature of this and it offers a totally different perspective of El Nido compared to that of which you get from the water by boat. There isn’t much point in talking too much about El Nido as I simply cannot do justice with words. You need to see the place in photos and videos to fully appreciate the beauty of the place. Below are some of my photos and you can also check out one of the many videos I put together of this simply breathtaking place. If you did want to read more, check out my blog about Palawan. The view from Habibi Restaurant at Submariner Diving Centre. What a view to enjoy while eating your meal! 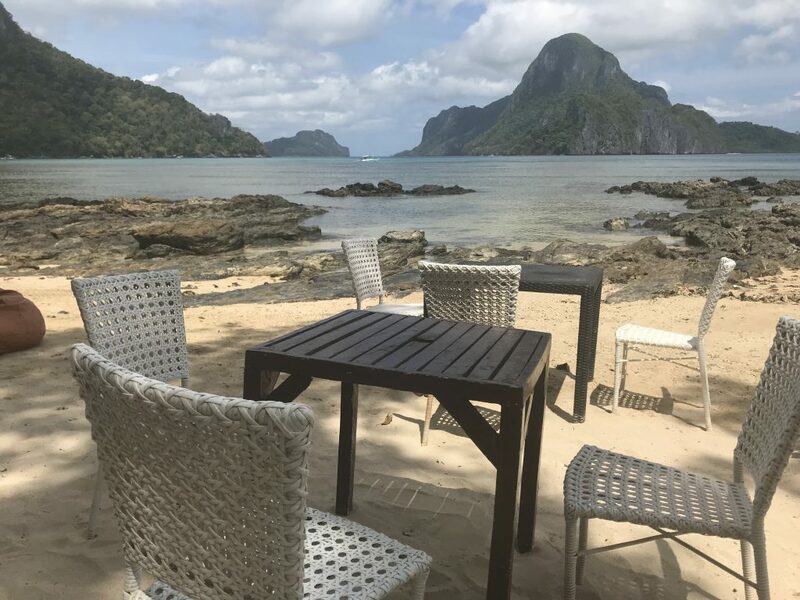 A beautiful little setting on the beach in El Nido town proper. 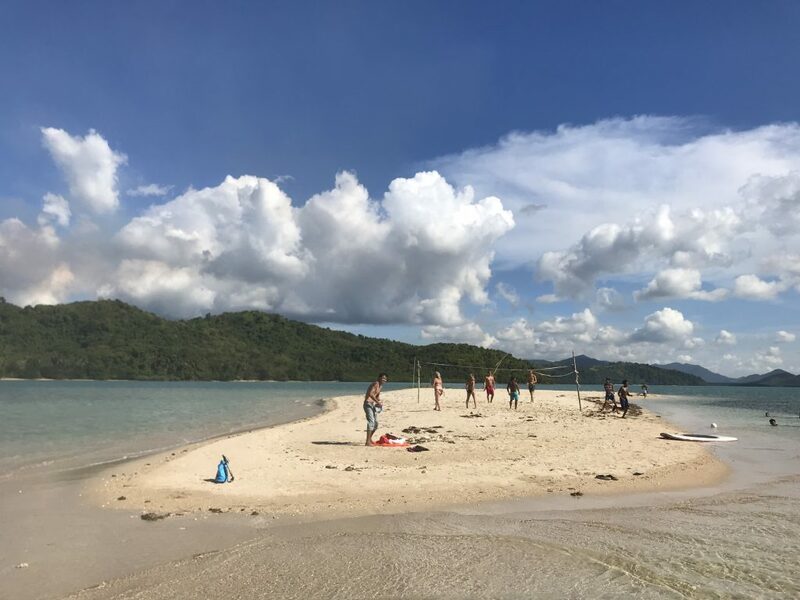 A sandbar that we stopped at during our Island Hopping adventure on the party boat. Pinagbuyutan Island typifies all that is El Nido. Limestone karsts, deserted white sand beach, palm trees swaying in the wind – true paradise. The local beach on El Nido town proper is very clean and has some amazing views across Bacuit Bay. Cadlao Island is a great place for scuba diving. Click below to watch my vlog about all the beautiful islands in El Nido! 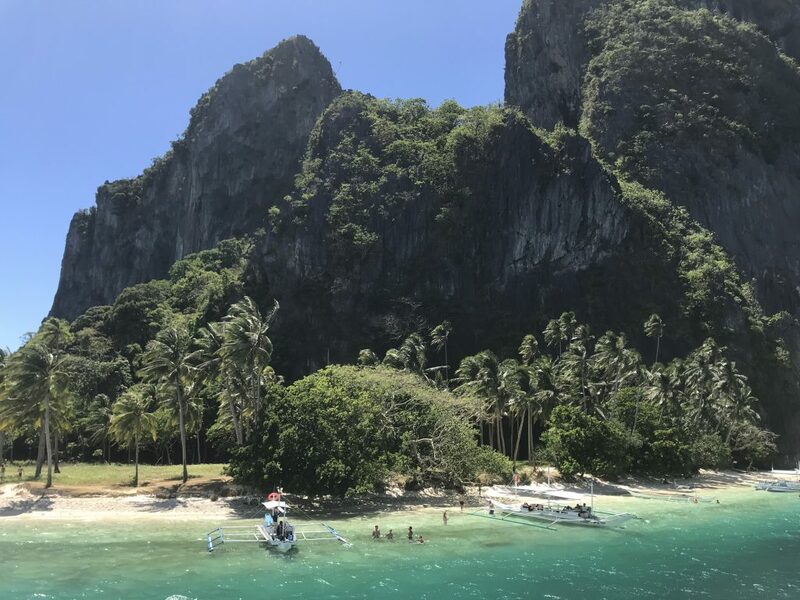 The direct flights to El Nido aren’t cheap but when you consider you are only about 15 mins from the airport to El Nido town center, it’s not about the price, it’s about the value for money. 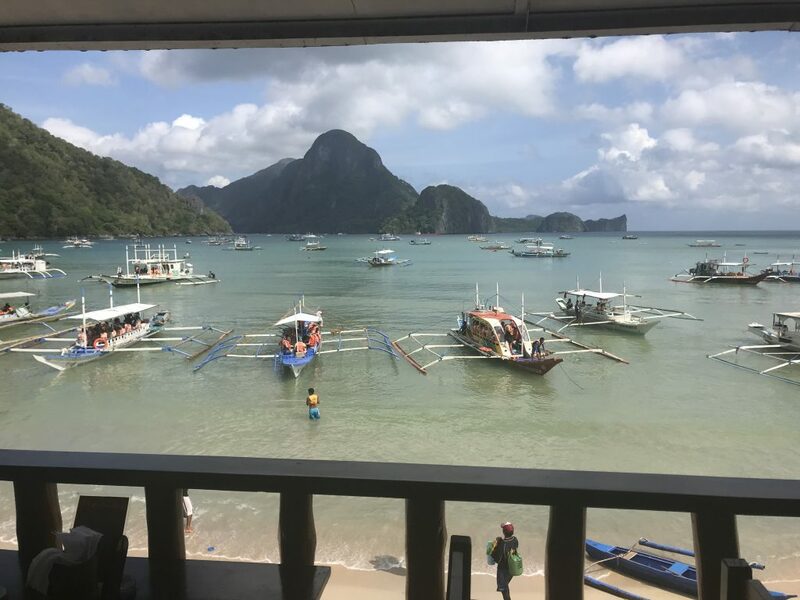 If you fly to Puerto Princesa, the cost of the flight might be less, but you still need to pay to get to El Nido and it can take 5-6 hours of travel by van. It depends on what you consider value for money, but there a few options you can choose from. From El Nido Airport, its only about a 15-20 minute tricycle drive to El Nido town proper. From Puerto Princesa Airport, it is about a 230km drive to El Nido, which takes around 4-5 hours. You can take a van from the airport which will cost around P700 or you can take a bus which will cost about P500. There are also hire cars available. There is absolutely no better way to discover the full natural beauty of El Nido than by boat. Scuba diving may not suit everyone, but most people can handle island hopping via a boat. Tour Z is the party boat tour which was one of my personal favorites. If you’re game, you have to give it a try! Click here for the video.